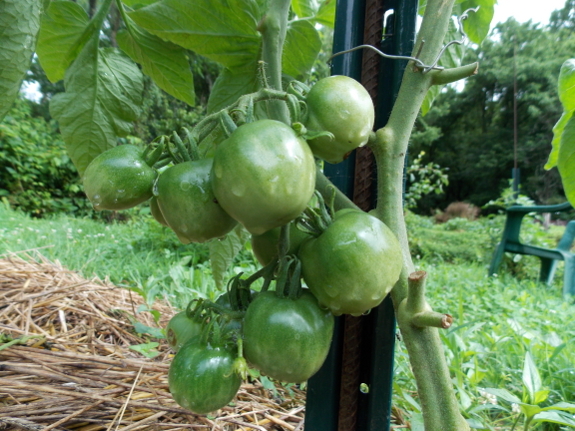 The interest in Mark's post about fighting tomato blight with pennies has been astounding. Even though I'm dubious about pocket change's effect on fungal diseases, that post's popularity made me decide to experiment with a slightly different form of copper. 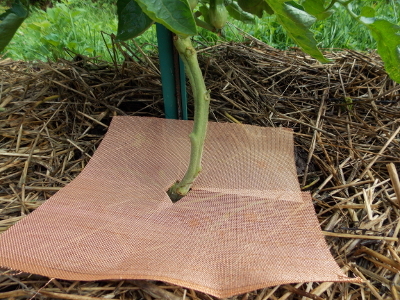 My budget for the project was the $80 we've made in ad revenue from folks coming to check out our tomato blight post, but I tacked on another $10 so I could try two types of copper --- this expensive and high-quality copper screen and this ultra-cheap mesh. Mark cut the screen into eight sections (each of which was a foot square with a notch to allow the screen to slide around the tomato stem), and I cut the mesh into four lengths that cover about the same area. My test subjects consisted of a row of yellow romas, where I alternated control (no copper), mesh, and screen beneath subsequent plants. The theory is that the anti-fungal properties of copper will prevent fungal spores from being splashed up from the soil line into the lower leaves (where blight usually first takes hold of a tomato plant). Organic farmers sometimes use powdered copper on tomatoes for this purpose, but that technique is dicey from a permaculture standpoint since the powdered copper gets into the soil and kills beneficial fungi as well as disease-causing species. Only time will tell whether a solid copper mesh will serve the same purpose without the harm to ecosystem life. Our chicken waterer is a tried-and-true experiment that provides clean water to thousands of chickens around the world. The question that seems to never be asked is how much copper or other elements 'should' healthy soil have? Or put another way. Given healthy soil will my plants will remain healthy? Or put still another way. Can I find some healthy soil, soil in which plants grow without disease or pests and make my soil like that soil? Will that work? The answer appears to be yes. Healthy soil exists. We notice that plants grow naturally healthy in some places. How can we reproduce that? The closest I have found is what is sometimes called 'Korea natural farming'. A series of techniques and practices that seem to be able to produce disease and pest free produce. So far, I seem to be having a little success, but haven't really followed the recommendations very well. But this method is probably a very good path to explore. From the photos I'd guess that the copper screen will perform better than the mesh, because the former covers a larger area and doesn't leave much room around the stem. The mesh looks kind of flimsy. Let's hope that the rain doesn't wash it away! It'll be interesting to see how they both perform. Here's another idea: copper shavings sewn between two layers of fabric (like a quilt). It could double as mulch around the plants as well. The fabric would have to be pretty rot-resistant to last and not be a feeding ground for fungi itself, though. Cotton probably wouldn't work. Maybe a synthetic fabric? Wonderful idea, however, copper oxidizes readily and turns green (like the statue of liberty) so I'm unsure of how long your mesh / screen will last. The oxidation, as far as I know is like rust, eating away at your specific metal. Copper oxidation, known as "patina" actually forms a protective layer around the copper (turning from copper to a copper oxide on the surface) thus preventing it from rusting away like iron would. What I don't know is will it still have the same beneficial properties once it does oxidize? Where to put the copper. I should have also said that putting the copper inside the plant is probably what the plant needs. It will dissolve what it needs. That said, from what I understand recent copper pennies don't have much copper in them. They are mostly zinc. Your plants may well need zinc also? Inserting a piece of copper wire into some of your plants would probably also be worthwhile experiment. 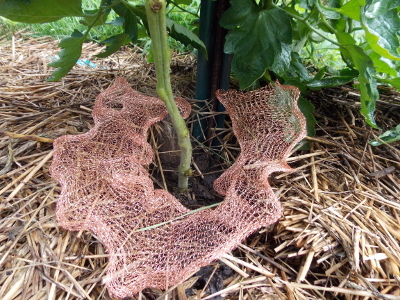 The way I have seen copper used with tomato plants is a bit of wire pushed through the stem. Very little wire is needed this way. Interesting question and interestng solution, but the real question is how bad is your blight problem? If you're not growing for a profitable cash crop, then why bother treating? The fungi deserve a break too. Why are there no wildlife charities to save rats, roaches, spiders or snakes? I saw you posted a followup in July to the Blight with the copper mesh... I didn't see another follow-up after that... did it work? I once grew these fabulous tomatoes... they were taller than I was. The next year the blight hit the area from the contamination of big box stores... now I get blight every year. I've tried new land, planting in containers... nothing seems to help. Wondering how the copper wire/mesh worked. Beth --- Here's the followup post. 2013 was a very wet year, and blight hit pretty hard, so it was difficult to tell whether the copper would have helped in a more normal season.